WHO : In the anterior thoracic region, in the fourth intercostal space, 5 B-cun lateral to the anterior median line. WHO : On the anterior aspect of the arm, between the long head and short head of the biceps brachii muscle, 2 B-cun distal to the anterior axillary fold. WHO : On the anterior aspect of the elbow, at the cubital crease, in the depression medial to the biceps brachii tendon. 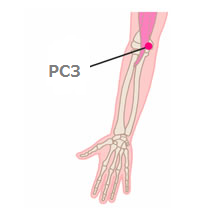 Note: When the elbow is flexed at 45 degrees, PC3 is located medial to the biceps brachii tendon. WHO : On the anterior aspect of the forearm, between the tendons of the palmaris longus and the flexor carpi radialis, 5 B-cun proximal to the palmar wrist crease. Note 1: With the fist clenched, the wrist supinated, and the elbow slightly flexed, the two tendons become more prominent. 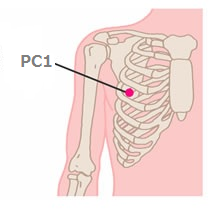 PC4 is located 1 B-cun distal to the midpoint of the line connecting PC3 with PC7. 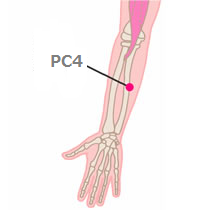 Note 2: If the palmaris longus tendon is not present, PC4 is medial to the flexor carpi radialis tendon. WHO : On the anterior aspect of the forearm, between the tendons of the palmaris longus and the flexor carpi radialis, 3 B-cun proximal to the palmar wrist crease. Note 1: With the fist clenched, the wrist supinated and the elbow slightly flexed, the two tendons become more prominent. 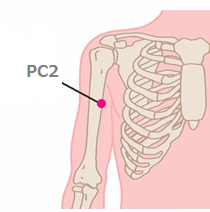 PC5 is located 3 B-cun proximal to PC7. 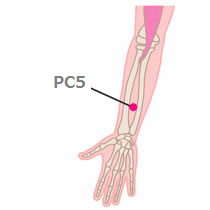 Note 2: If the palmaris longus tendon is not present, PC5 is medial to the flexor carpi radialis tendon. WHO : On the anterior aspect of the forearm, between the tendons of the palmaris longus and the flexor carpi radialis, 2 B-cun proximal to the palmar wrist crease. Note 1: With the fist clenched, the wrist supinated and the elbow slightly flexed, the two tendons become more prominent. 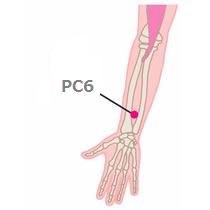 PC6 is located 2 B-cun proximal to PC7. 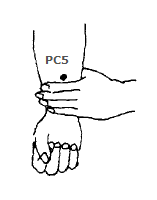 The posterial point corresponding to PC6 is TE5. 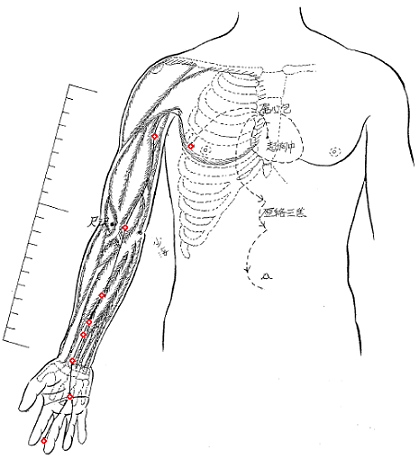 Note 2: If the palmaris longus tendon is not present, PC6 is medial to the flexor carpi radialis tendon. WHO : On the anterior aspect of the wrist, between the tendons of palmaris longus and the flexor carpi radialis, on the palmar wrist crease. Note: With the fist clenched, the wrist slightly flexed, the two tendons become more prominent. 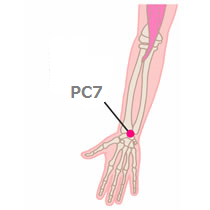 PC7 is located at the midpoint of the palmar wrist crease, between the tendons of palmaris longus and the flexor carpi radialis, at the same level as HT7, at the proximal extremity of the pisiform bone. WHO : On the palm of the hand, in the depression between the second and third metacarpal bones, proximal to the metacarpophalangeal joints. 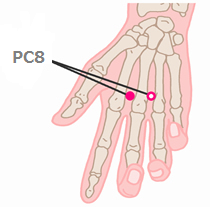 Remarks: Alternative location for PC8 – On the palm of the hand, in the depression, between the third and fourth metacarpal bones, proximal to the metacarpophalangeal joints. WHO : On the middle finger, at the centre of the tip of the middle finger. 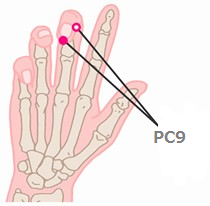 Remarks: Alternative location for PC9 – On the middle finger, 0.1 F-cun proximal to the radial corner of the middle fingernail, at the intersection of the vertical line of the radial side of the nail and the horizontal line of the base of the fingernail.